We fall into Mother Nature’s embrace when we give into our natural longing to live off the grid. We sometimes take to the road with a solid plan, and sometime stake only backpack when we’re on the fly. Put simply, camping purifies our souls. We escape from the hurry and the hustle of the big city. We feel our freedom; strengthen our ties with the soil. Certainly, better sleeping awaits us in the forest! Where do you like to camp? By the seaside or in the woods? Have you ever camped out on a legendary mountain? Turkey’s mountains offer many options for mountaineers and campers. Many of these mountains have been the subject of much research and exploration and they feature into both Anatolian and Greek mythology. I plotted a route for myself across these mountains and when I had free time, I camped there. I listened to birds and heard leaves rustling in the mornings… I touched the soil. I was cleaned with water from the mountain streams. Some days I saluted a green landscape, other days, white. Below, I will tell you about some of the mountains where I have camped. Discover yourself in a big, grey, lonely mountain! 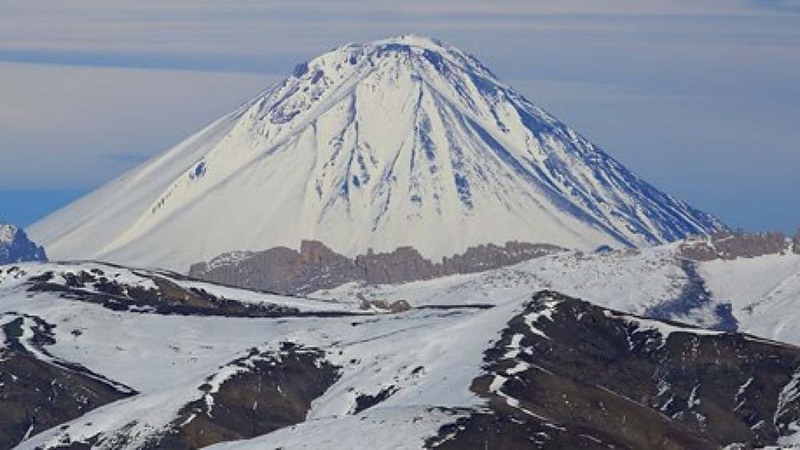 You should spend a few nights on Turkey’s highest mountain Mount Ararat. Even in the summer, you can feel the deep cold of snow which thaws across all four seasons. Waking up in a white landscape is breathtaking. Don’t forget your winter tent and cozy sleeping bag. Remember: even in summer, cold weather is waiting you in these foothills. You don’t want to have to cancel your route because of being ill-prepared. Although the Koran calls it Mountain Cudi, according to the Old Testament, Noah’s Ark ran aground on Mount Ararat after the biblical flood. This mountain has some different routes, ranging from hiking to ice climbing options. 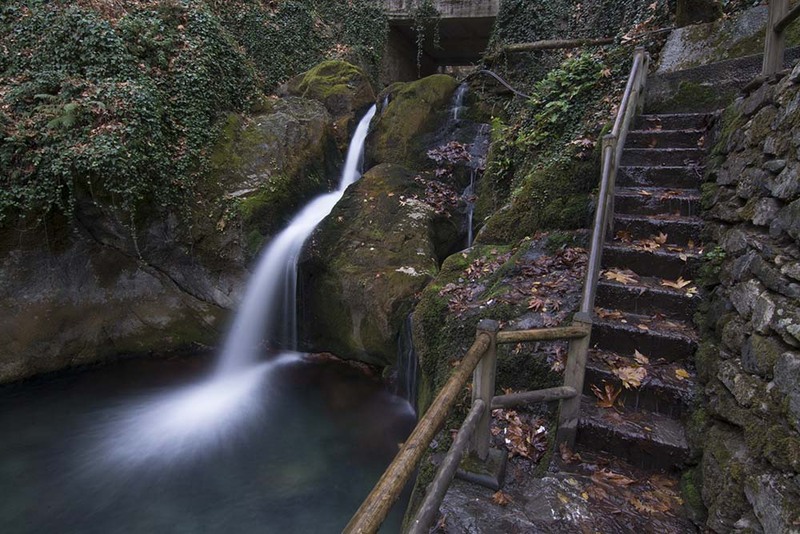 And rest assured that there is seemingly no end to the options to immerse oneself in the lush green landscape, with the countless different versions of the color marking this heavily forested place that complements perfectly the Black Sea’s own gorgeous green. You can easily reach the summit with the Classic Route, or another well-known trail is the South Route. You will get to see Dilberdüzü camp area’s admirable views after about five hours walking. 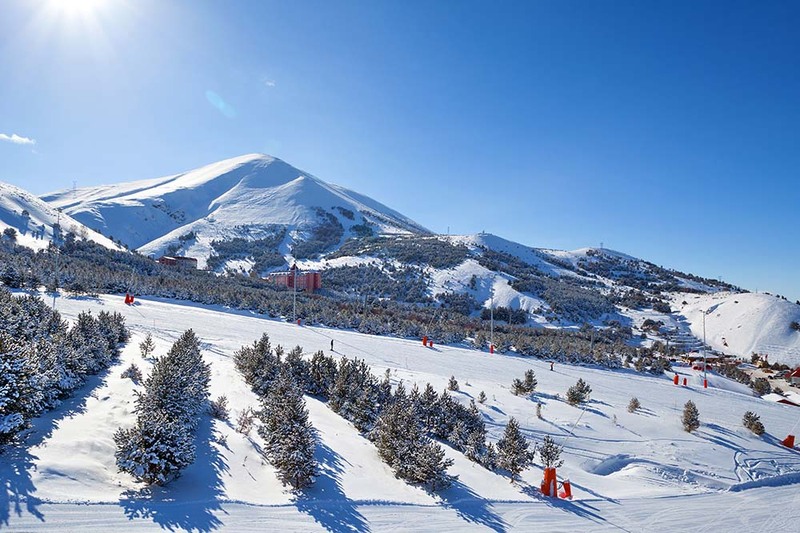 Mountain skiing and snowboarding – Palandoken, Erzurum, Turkey. If you visit this mountain in May, you can see the blossoming flowers on the mountain.. This mountain’s name has appears in mythology and especially in many Anatolian legends. Don’t forget to take the necessary technical equipment for climbing. Although it’s not a difficult mountain, the right equipment is vital, as is taking precaution. Abdurrahman Gazi’s legend took place on this mountain. The shrine in honor of him stands on the upper slopes, and most everyone in the region is aware of where the standard-bearer, His Holiness Prophet, stands. Munzur Valley with snow, Tunceli. A world bursting with a huge variety of flowers and vegetation, rivers, and creatures awaits your discovery in this mountain’s deep valleys. Don’t leave before listening to the Father Munzur legend about a shepherd named Munzur and a landlord who lived in Ziyeret Village in Ovacık. The birth story of Munzur’s water originated in this legend. In 62BC, King Antiochus Theos of Commagene had built many sculptures and temples of Greek and Persian gods and his tomb lies in this mountain. 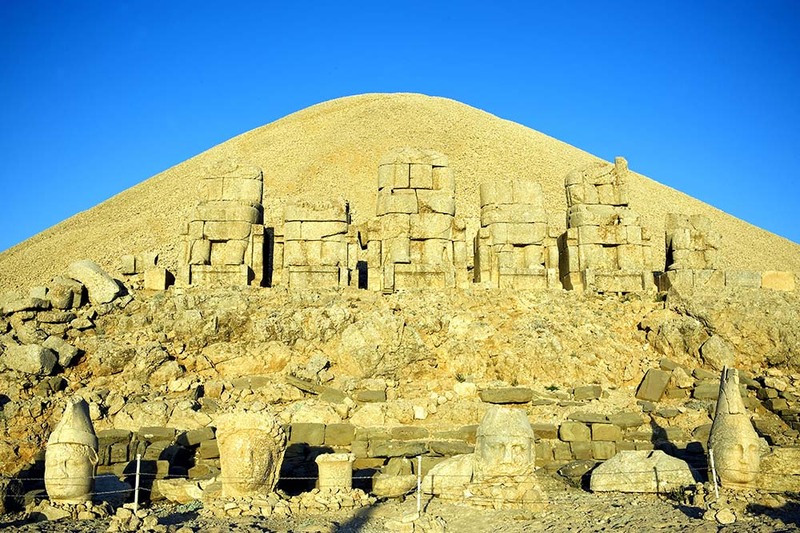 The sculptures, arranged in the shape of Hiyerotesyo, fascinate people, and some claim that Nemrut Mountain tells many stories to those willing to listen. The mysteries of this mountain are innumerable. Many important historical subjects from Christianity originated here: some believe that this is Jesus’ birthplace, while, other seven claim that the mountain acts as a hidden base for aliens! Also note that in 1987, this mountain was declared a World Heritage Site by UNESCO. You can catch a variety of beautiful views of Van Lake during every moment of your climb to the now inactive volcanic Suphan Mountain. You can also camp in Şekerpınarı or Suphan highland. 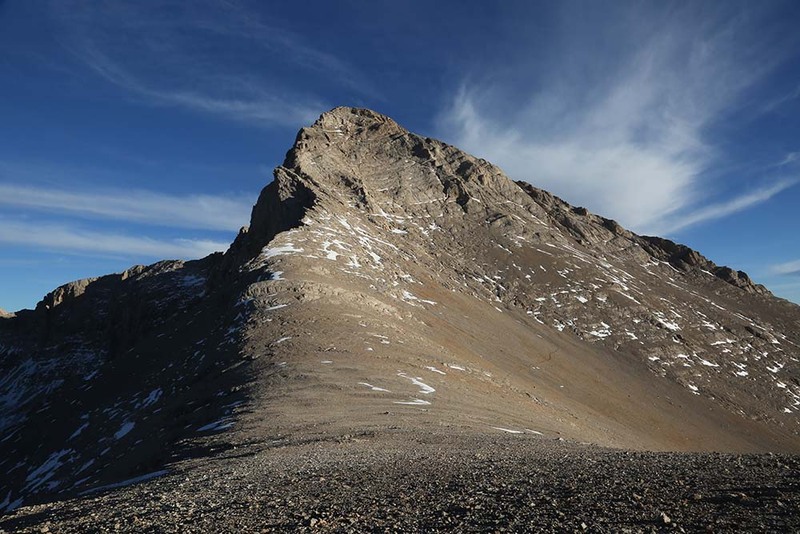 The climb and return to the summit from the camping area takes between 8 and 10 hours. 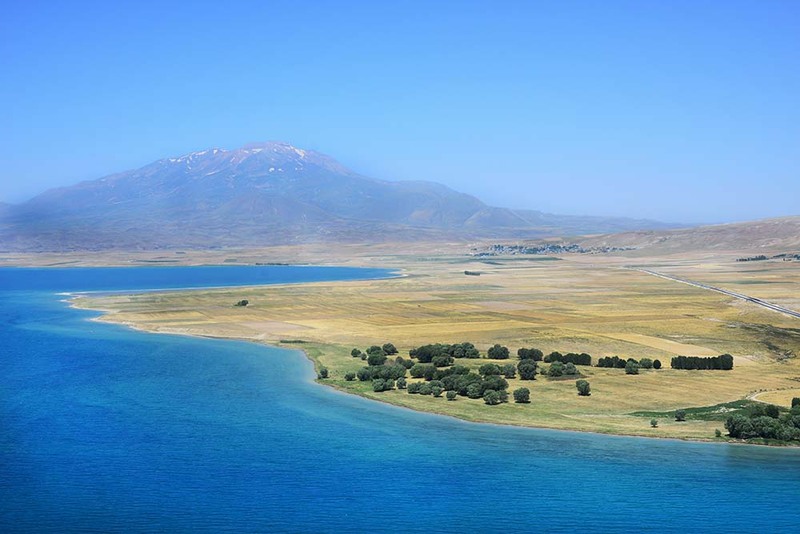 Van Lake and Mount Suphan, Van, Turkey. 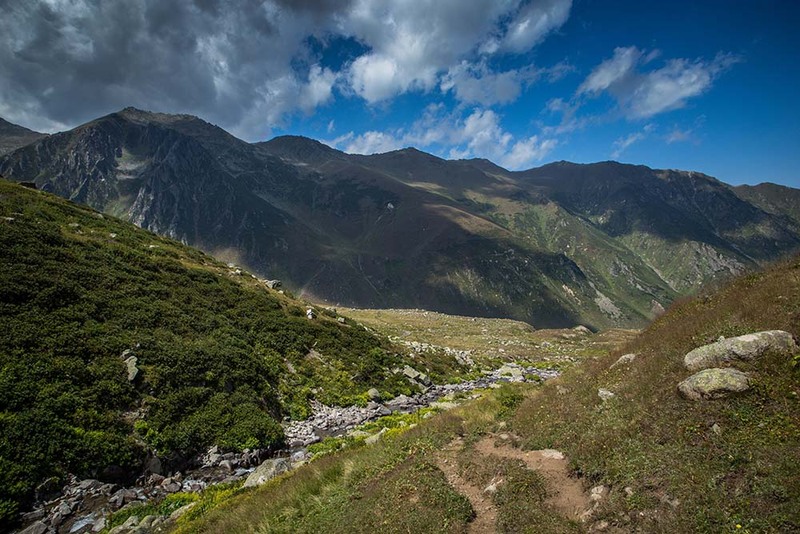 Hatice and Siyabent’s legend of immortal love story is told in this mountain. Legend has it that two roses bloom every year, just after the snow starts to melt, at the very place where this couple fell to their deaths to the water. Who knows… maybe you will feel this legendary couple’s love. In any case, don’t camp alone on this romantic mountain! June, July, August, and September are the best months for climbing. Even if there exists some discrepancy according to the Koran, Noah’s Ark runs aground to Mount Cudi after the biblical flood. Naturally, this mountain is important in the history of religions, particularly Islam. Volcano Mount Erciyes in the evening. The snow is dwindling away. If you climb from the Hisarcık direction, the best camp area in this mountain is Çobanini. If you climb from the North, the ideal camping spot is Sütdonduran Plateau. 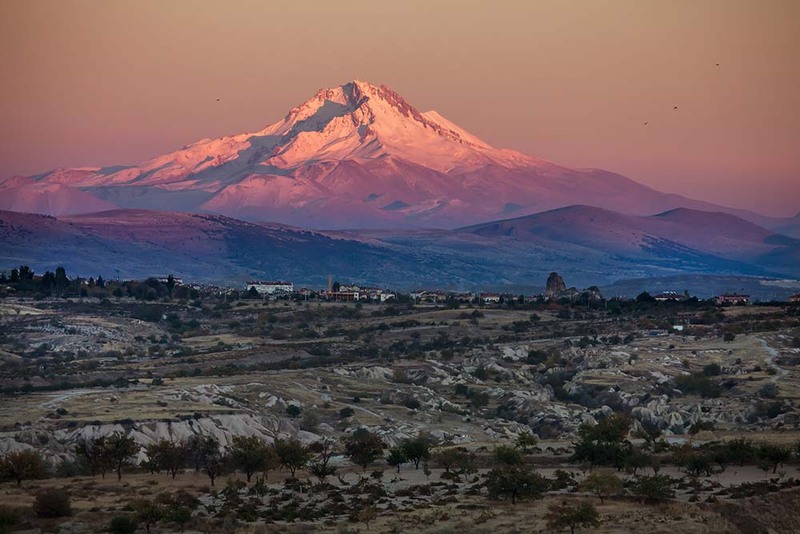 Mount Erciyes has a sorrowful legend, as does every mountain. 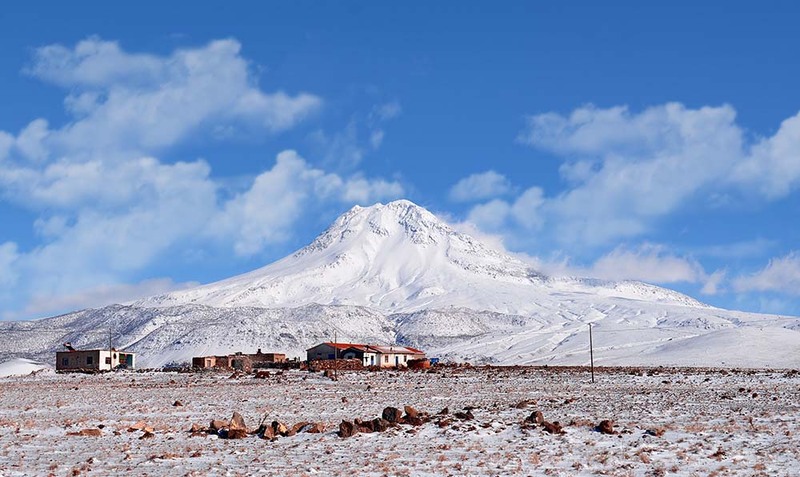 The legend tells of Cis Hatun, of the Ercişler Tribe, and how her lover had to kill a dragon, living at top of this mountain, in order to marry her. 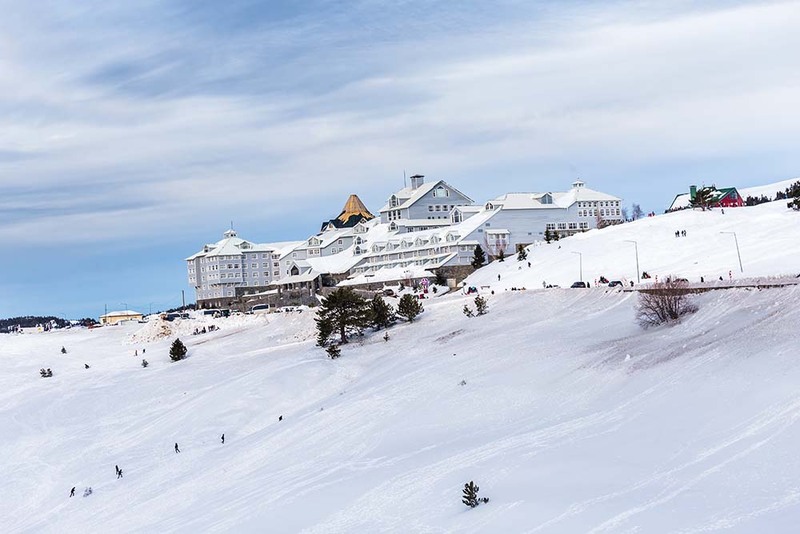 Mount Erciyes’s eternally white summit is the key of this legend. 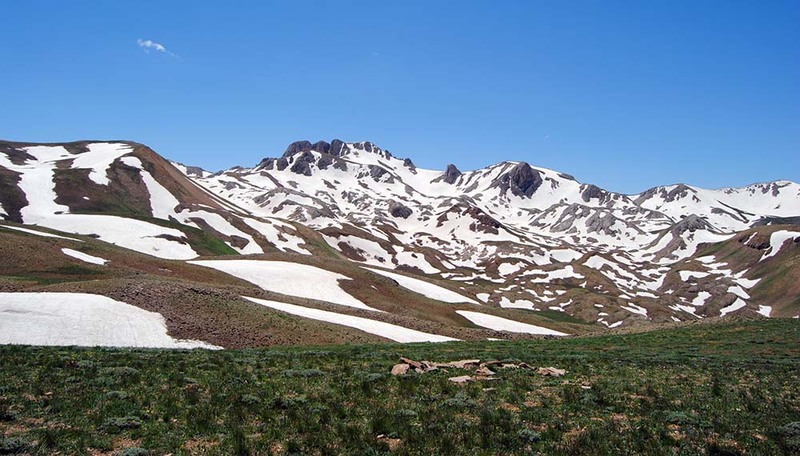 This mount is located on the provincial border between Niğde and Aksaray. An ancient Roma’s town, today’s it’s called Nora. Mount Hasan’s foothills are full of oak trees. Mount Hasan’s name comes from Grandpa Hasan who lived in ancient times. Mount Alaca at Aladaglar National Park in Nigde, Turkey. Aladaglar is most important mountain range in Turkey. Aladağlar is rich in terms of vegetation and types of animals, and it’s a great place for mountaineering activities. Due to snow melt in the spring, many lakes form at Aladağlar, but during the dry summer season, most of these lakes evaporate. I recommend you try climbing in June, July, August, and September. Demirkazık is considered the most important summit of Aladağlar. You can walk from Çukurbağ Village, about 1.5 hours total, to check out the Sokullupınar camp area. If you want to climb from the camp area to the peak, don’t forget that the round trip takes between 10 and 12 hours. This mountain’s “Böğürlü Legend” is interesting. People call it Mountain Böğürlü because of its occasional landslides, which sound like water buffalo and ox at play. Babadağ also deserves attention with its rich vegetation. 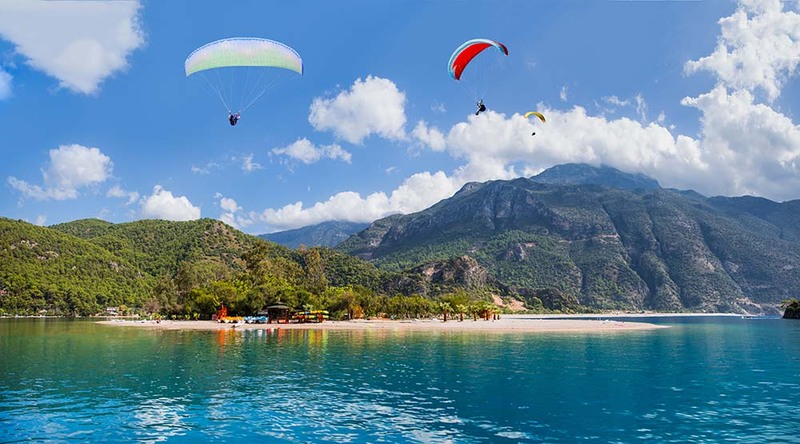 Babadağ summit and the lower Kartepe summit are very close to the sea, so paragliding is a popular sport in Fethiye and nearby areas for tourists. 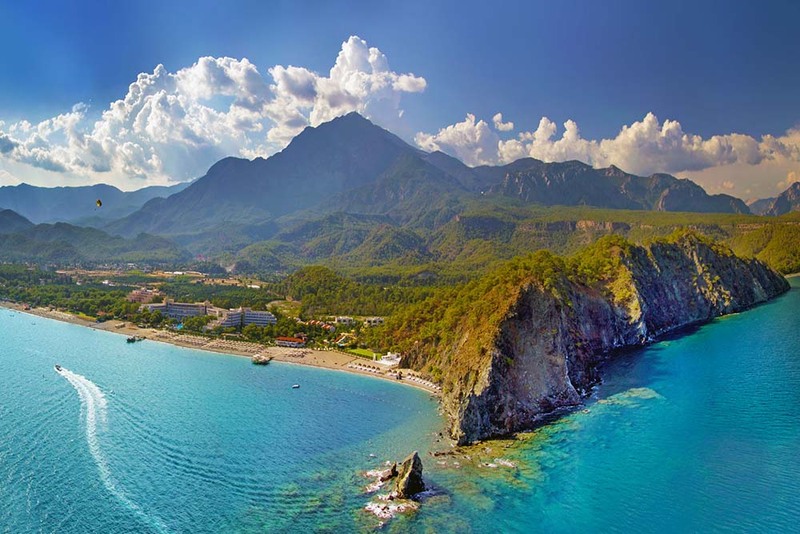 Fethiye is, in fact, the most popular camping place in Turkey. You can camp for a long time at areas like Kabak Bay and in Butterflies Valley. When you visit here, I recommend you try paragliding. It creates such an incredible feeling– the closest feeling to flying! Olympus was the most important city in ancient Lycian civilization and it took its the name from Mount Olympus known as Mount Tahtalı. Olympus is, in fact, the second most popular camping area,and a favorite spot for backpackers, students, and hippies. Many new businesses were opened here as it became more popular, and therefore free camping is now harder to find. Besides camping, you have options like bungalows (some of which serve breakfast).Don’t leave here before walking Lycian Way, but be aware that this road takes a lot of time. You should manage it in about 10 days, and of course you can camp in various places along the way. This area is protected because the Caretta Caretta turtles live here; when you go close to the ocean, you’llbe surrounded by their nests, since they return to this place every year to lay their eggs. It’s important to avoid going near the water at night, so as not to disturb them! Don’t miss to the chance to swim with planktons at the right time of the year! You’ll leave feeling like you were in a fantasy movie. And do not finish your camping adventure before visiting Chimera, which was the subject of the Ballerophon and Chimera Legends. Autumn in Kure Mountains National Park in Kastamonu province, Turkey. Many of the area’s historical textures ranging from traditional village houses to traditional dress have been preserved here (yes, the women still wear traditional fashions), and local foods too. Some indigenous plants are still used for medicinal, aromatic, and gastronomic purposes. The locals have attached special importance to nature phenomena here, like legendary entombed saints, shrines, and pilgrimage spots—all of which are examples of protected local cultural heritage. Mount Ilgaz is one of the most active mountains for winter sports. Ilgaz folk song as we all know comes from this mount. When someone speaks of winter and nature sports, the first thing people think of is Uludağ. You can see Istanbul and the Sea of Marmara from Uludağ’s peak in clear weather. In addition, hot springs occurred, owing to a geyser, and they are a tourist draw. They provide a good opportunity to soothe aching muscles. 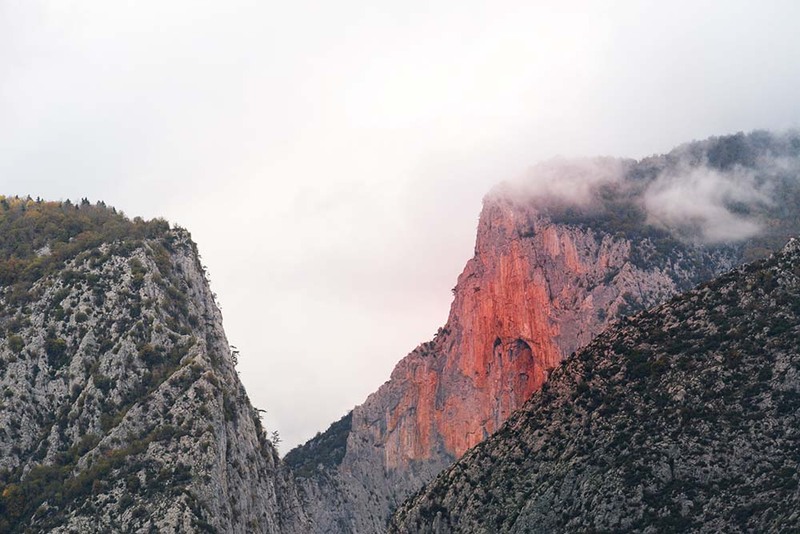 There are many mountains labeled “Olympos” across Greece and the Ionian (Aegean) regions. Due to that, Uludağ’s is also known simply as Olympos. In fact, all high mountains were called Olympos in ancient times. Ceneviz Bridge in Kazdagi Mountain. Recently, Mount Ida (also as known Mount Kaz) has become a popular ecological camping area. People who settled in the region created new stories in order to add their own cultural layers to earlier people’s oral heritage. Although local people, religions, and sects always encounter change, people’s attitude is one thing that resists change here. The effect of the natural surroundings on the human mind is one main factor in mythology. Mount Ida was given its name by Cretan sailors, and it is important in Greek Mythology. It is called “Ida with a Thousand Springs” in Homer’s Iliad. According to legend, the famous beauty contest which instigated the Trojan War took place here, Zeus was born here. Beyond that, the Gods watched Trojan War from here and it’s where Aphrodite fell in love for the first time. Legend of Sarıkız’s popularity goes from Mount Ida to Iran. It is the most famous Islamic legend of Mount Ida. The Legend of Sarıkız is extremely common in Turkmen villagers’ myths, and by now it has several versions. Each mountain deserves a visit. Besides camping, there are many historical and cultural experiences to experience. Take your tent and backpack and head out to Mother Nature! It is the best way to spend time with your children and friends. Do not forget: be good to Mother Nature when you’re having fun in the forest or at the ocean – and let the Earth absorb all the bad energy of the big city.